On Saturday my lovely friend Emma invited a few of us round to her gaff for a little relaxed soiree... After a week of feeling lousy, it was just the tonic I needed. So... I decided to make a cake to take with me. 1 ship-shaped tin. Mine is Nordic Ware. Your choice of decorations, icings etc. Pour the yoghurt and the extract into the creamed ingredients and mix well. Stir in the chocolate chips, ensuring even distribution. To make your sails cut out three different sized rectangles from your card. Pierce a hole at the top and bottom of each sail using the skewers, and push each piece of card so it curves slightly. Roll your sugar paste directly onto the cake board then trim the edges. Place the cooled cake on the covered board. Pipe detail onto the cake using royal icing or pre-made gel pens and stick on your desired fancy things e.g. stars at the end of 'blasting' cannons! I finished the sea off with edible blue fish! Finally, just before revealing, pop your masts into the cake for the full 'pieces of eight' experience! 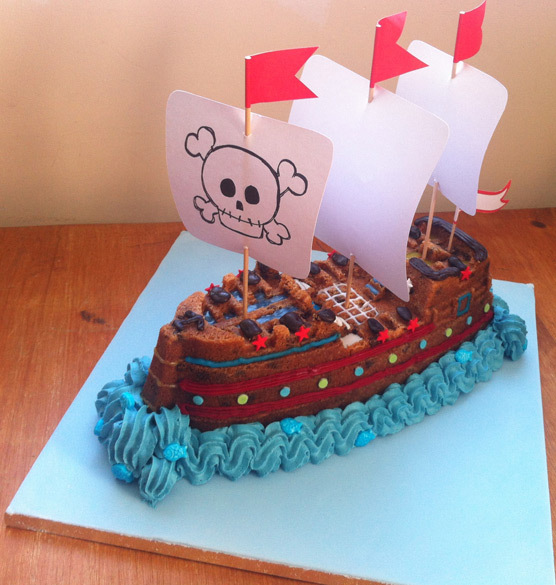 Tip: the best way to transport this cake is sans sails and in a cardboard cake box the same size as the cake board. Snugly does it. I got mine from a cake decorating shop. It was a really fun little project, and the recipient loved it! I'm glad he enjoyed it! It was a labour of love that cake! Oh my, this looks too good for words! Love love love this, thanks so much for sharing! You were very creative to have come up with this by yourself. I am afraid that I can't do the same. I'm not as talented as you. 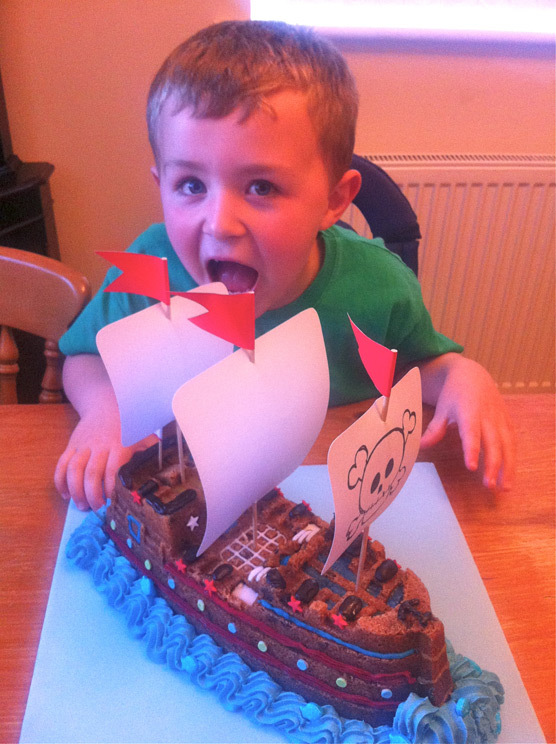 I see that the little boy is enjoying his little pirate ship cake. Thank you! Sam loved this one! WOW! They all look amazing! I love the Toffee & Choc Chip Pirate Ship Bundt! Looks awesome and yummy!